I’m sharing this salad in honor of my stepsister. It’s her favorite and she always makes it for family dinners when she’s in town from New York. She usually adds blue cheese, but I’m including goat cheese because it sits better with my tummy. The grapefruit is tart with a hint of sweet. The red onions bring the bite and crunch to this salad. The avocado brings the suave into the mix. The mixed greens are packed with as much flavor as lettuce can bring. The goat cheese (or blue cheese) adds the tang and creaminess to round out the salad. Now…top it with the strong, tangy flavors of the Real French Vinaigrette from Brianna’s and you’ve got yourself a crazy delicious salad. Cray-cray delish friends. While grapefruits are a winter citrus fruit, they are readily available here in Texas…Ruby Reds baby…mmmmm! (Random fact: Red Grapefruit is the Texas state fruit. Who knew!) I’m sharing this recipe now because avocados are plentiful and my guess is that you can find a grapefruit nowadays. It might be harder to find good ripe avocados in the winter months, however. French Vinaigrette, as much as you like! Add the mixed greens into a large mixing bowl. 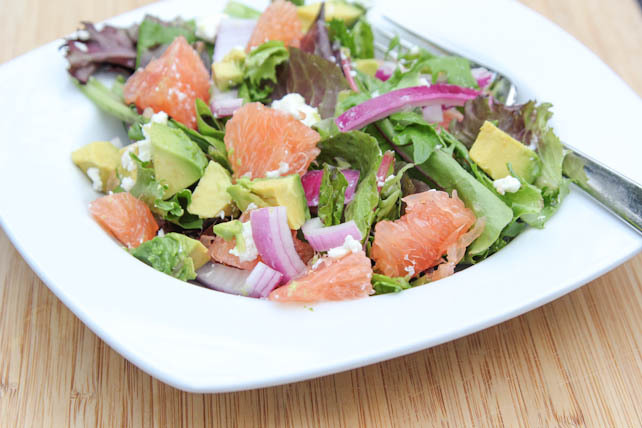 Toss in the red onion slices, grapefruit segments, diced avocado and crumbled goat cheese. Toss in as much dressing as you like. 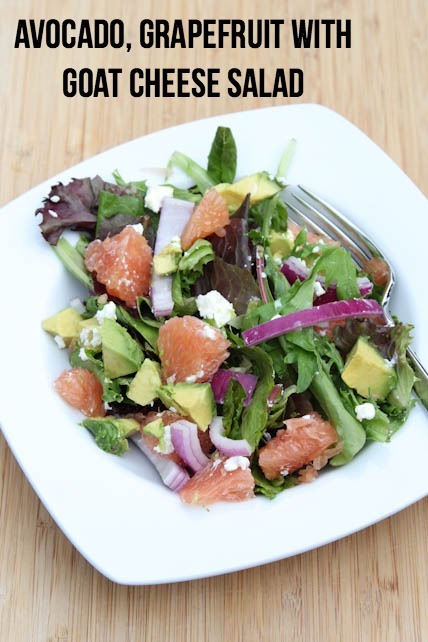 Serve Avocado, Grapefruit with Goat Cheese Salad for lunch or take to a potluck or gathering. Link for the salad dressing doesn’t work, could you possibly post? Thanks! I tried this recipe out before The Sisterhood Luncheon at my church and it was fabulous! All the girls asked me for the recipe and I was entirely honest when I told them where I found it when I was looking for a new twist on a refreshing salad. I LOVE making salads and finding different healthy lunch recipes to make for my husband and I and he loves everything I make (which is rare to find when a man can have his picky moments. :P) Thank you for this recipe! I added it to my arsenal of yummyness recipes!